The first BlackBerry 10 smartphone has been unveiled at BlackBerry World 2012 by RIM CEO Thorsten Heins. 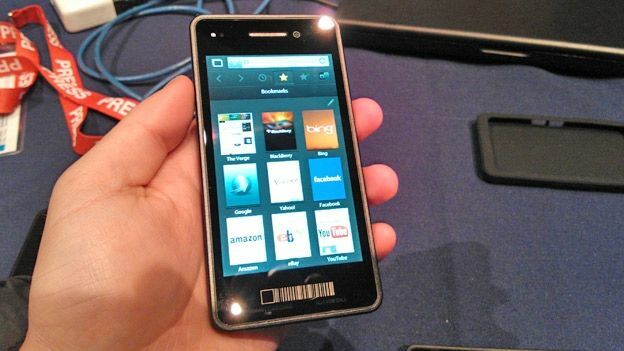 The BlackBerry 10 Dev Alpha prototype is a fully working BlackBerry 10 smartphone. Featuring a build that is similar to that of the PlayBook the BlackBerry 10 Dev Alpha is running a developer build of BlackBerry 10 and will be made available to developers. With always-on multi-tasking the Blackberry 10 OS allows users to always access their notifications by simply swiping across the screen, this can then be used to swap applications as well with a graphical UI that looks similar to turning a page. The keyboard has been completely updated for touchscreen handsets with fluid 'swype-style' predictive text and the ability to 'throw' predicted words up into the copy. There's no word as yet on specs but given the processor-hungry nature of the UI of BlackBerry 10 expect the Dev Alpha to be running a dual-core processor or higher. Featuring the same touch sensitive bezel found on the BlackBerry PlayBook the Dev Alpha has a 4.2 inch screen and we can now confirm that with a 1280x468 resolution screen this thing trumps even the HTC One X and Samsung Galaxy Nexus. NFC is on-board with the BlackBerry 10 Dev Alpha able to connect with NFC-enabled devices while on the side there's a memory card slot and a series of charging and connecting ports. At present the OS is a modified version of BlackBerry PlayBook 2.0 so don't expect to see the same beautifully fluid UI that was shown off at the keynote speech.